In fact, one of the best meals I enjoyed in all of 2011 was an Outstanding in the Field (OITF) dinner, at Riverbend Farm near Delano. I realize that a setting so gorgeous can work strange magic (farm goggles? ), but I’m quite sure that aside from the view, the bounty of family-style platters, piled with fresh salads, cheeses, and wood-fire grilled meats, would blow my mind in the dingiest of rooms. When the night ended with chanterelle mushroom ice cream – a dish at once delicious, clever, and just plain fun – I knew I’d had an unforgettable meal. Weiss and Doherty sell their heritage-breed Berkshire and Gloucestershire Old Spot hogs directly to food enthusiasts and a few local chefs, including chef Mike Phillips of Three Sons Meat Company (formerly Green Ox). I tagged along with Phillips and chef Scott Pampuch – the two are this year’s OITF host chefs – as they scouted the farm for the event and chatted with Weiss about Little Foot’s sustainable philosophy and their careful practices for humanely raising and selling best-quality, highly-prized pork (as well as chickens, eggs, produce, and bedding plants). As we talked, there might also have been a fair amount of piglet cooing going on, even by the charcuterie boys (the pic up top might be one of my favorites, ever). Oh my goodness the Gloucestershire Old Spot piglets are adorable with their snuggly snorting and flirty sly smiles. We were smitten! You’d think it might have been tricky to move from petting pigs to planning the menu but alas, it was a seamless progression. Both Phillips and Pampuch are known for their pork mastery, so it goes without saying that the meal – which will also include piles of gorgeously prepared vegetables – will be at its essence utterly porktastic. The charcuterie was begun the very next day, in fact, with the butchering of two hogs. 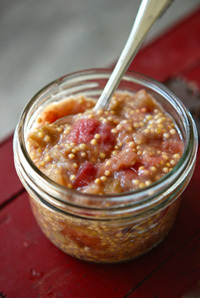 Picture a dinner table set with a colorful variety of snappy, custom-made condiments to sample with each course, including the spicy-tangy-sweet Rhubarb Mostarda pictured below. Serve the mostarda as a foil for rich pork belly, pork terrine, or pork rillettes. Buy tickets for this year’s dinner at the OITF website. See Little Foot Farm’s website if you’re interested in purchasing heritage-breed pork, chicken, eggs, produce, or bedding plants.